Lorain County Public Health gives guidance on how to clean up mold. Control moisture and water in your home to keep mold spores from growing. Use a soap-water solution to clean up mold - just add some dish soap to warm water and wipe the mold away. Or, use or a bleach-water solution to remove the mold - add 1 cup or less of bleach to 1 gallon of water. Some commercial products can also remove mold. If you have any questions about cleaning up mold in your home, call LCPH at 440-322-6367. Molds are found in almost every environment - indoors and outdoors, year-round. 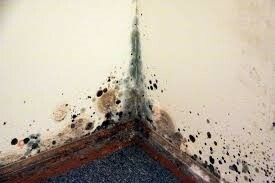 Warm, humid weather helps mold grow. Outdoors, mold likes shady, damp areas or places where leaves or other plants are decomposing. Indoors, mold likes high humidity normally found in basements or showers. Mold growth happens indoors when mold spores land on wet surfaces. No types of mold grow without water or moisture.